A couple of days ago I wrote a post about trimming Angoras. I had done some minimal plucking but didn't realize that this could be considered cruel treatment. Of course, looking back, what I was doing was probably very wrong. (And I so hate to be wrong.) From what I read online there is a right way to do it that doesn't put the bunny in any sort of pain. There is also a second method which uses shears or scissors. 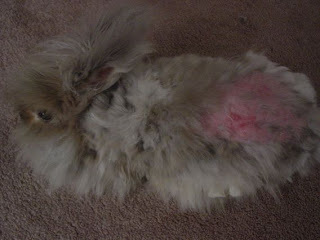 I am totally not a professional but I wanted to clean the bunny up as she was getting matted again. So I stopped with the plucking and grabbed some scissors and viola! Couldn't pay me enough to cut your hair this good. =P Really, her skin is not that red and irritated where we plucked the hairs. Plus, there were some spots that appeared to be irritated due to build up of matting that have visibly gone down. I also noticed there was some areas along her sides that had undergrowth. Whenever I tried to get a good grasp on the hair it would just pull loose without any effort. She wouldn't even budge or squirm. I think that is probably the way its supposed to go. In fact, I'm starting to think that the whole shedding process isn't something that is achieved all at one time. Poor Ladybird. Seriously, I'm making a commitment to brushing her twice a week from now on.